The sounds of Jai Mata Di purifying the air, beautiful idols of Goddess Durga in every nook and corner of our streets, invitations from neighbours to attend the colourful and pious Mata Ki Chowki, lovely sounds of the playing of dandiya sticks, swirls and whirls of stunning ghaghras, aroma of the singhara barfi and aloo halwa…just these words are enough to paint the picture of our country during the festival of Navratri in North India. Yes, soon it will be that time of th year when one and all will forget their differences and get together for a dandiya or garba session. Join me as I re-visit and wait for the immensely powerful and positive vibrations of Navratri to fill up our lives. Fasting & feasting, worshipping & sharing, dancing & singing… the nine days of Navratri give us a chance to express our gratitude towards Maa Durga, indulge in lavish meals with our loved ones, dance to the beats of the dandiya and above all reaffirm our faith in the power of the mother, goddess Durga. In Navratri, we invoke the energy aspect of God in the form of the mother referred to as Durga, which literally means the remover of miseries of life. She is also referred to as Devi (Goddess) or Shakti (energy or power) or Maa/Mata (mother). Our worship of Shakti re-confirms the scientific theory that energy is imperishable and cannot be created or destroyed. It is always there, always alive, always intact and empowering. I still remember as a kid asking my grandfather why did we call Goddess Durga ‘Maa’ and what he explained to me is still so vivid in my mind. 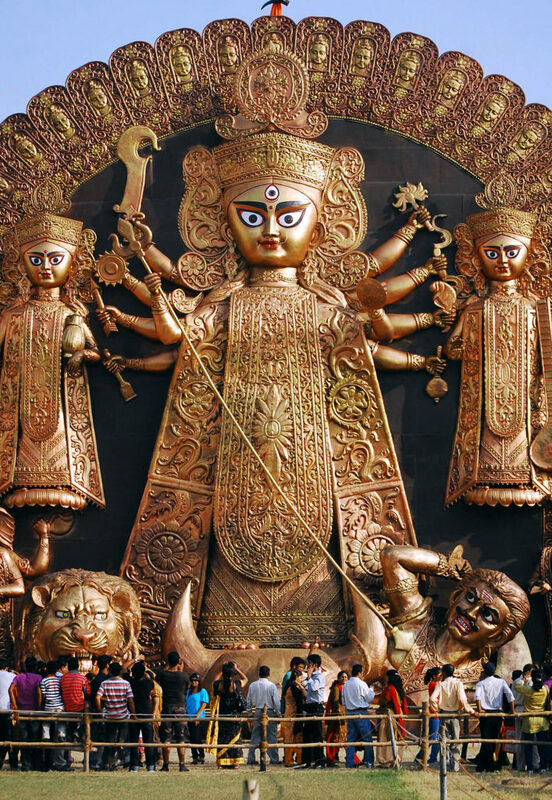 He said, “It’s only a mother who can never refuse what her child asks from/of her.” And yes, such is the faith in Durga, a faith that is undeterred, strong and eternal. Interestingly, this is one festival that lays emphasis on the supreme qualities of a mother, the creative aspect of the absolute. At this point, I’d like to mention a Sanskrit shloka that reflects the immense belief of the devotees in the power of Maa Durga. “Ya devi sarva bhutesu, shanti rupena sansthita (Goddess who is omnipresent as the personification of universal mother), Ya devi sarva bhutesu, shakti rupena sansthita (The Goddess who is omnipresent as the embodiment of power), Ya devi sarva bhutesu, matra rupena sansthita (The Goddess who is omnipresent as the symbol of peace), Namastasyai, namastasyai, namastasyai, namo namaha (I bow to her, I bow to her, I bow to her again & again!) It is this love and faith for Durga that makes the believers celebrate and worship her nine avatars. During the nine nights and ten days of the festival, nine forms or avatars of Shakti are worshipped (To know more, read box). Many devotees fast for all nine days, while others fast in pairs with a family member. Fasting is another way of expressing gratitude and love towards the Maa. As for me, out of the ten days two days hold a special place, the eighth day known as Ashtami and the tenth day known as Vijayadashmi/Dusshera. On Ashtami, my grandmother used to prepare the Ashtami puja thaali (plate) with incense (dhoop), deepak (earthen lamps with cotton balls dipped in ghee/ oil), chunri, flowers, bindi, bangles and prasad to perform the Mahashtami Puja. There was a special bhog prepared on this occasion to offer to the Goddess. I remember how as a child, I along with my friends and cousins, would wait to get our hands on the lavish meal, which comprised kheer, lauki halwa, aaloo halwa and more! The other favourite day involved sitting atop the shoulders of my grandfather and watching the effigy of the Ravana being lit! My friends from Bihar, Kashmir, Punjab, Uttar Pradesh, Madhya Pradesh and Haryana tell me of the custom that is followed in their households on the eighth or ninth day i.e. worshipping of nine young girls. It is called Kanya Puja and is usually performed on the ninth day, Navmi; the girls representing the nine forms of Goddess Durga. The little girls have a good time as their feet are washed and they are adorned with kumkum on their forehead, treated to a lovely meal and given new clothes amongst other gifts. And while the festival is about praying and expressing gratitude towards Maa Durga it is not confined to just that. The popular, colourful and celebratory Dandiya Ras is an event that is organised at many places. Dandiya or Garba, originating from Gujarat, is an inseparable part of the Navratri and people swing to dandiya beats in traditional attires all through the nine nights. In South India, people set up steps and place dolls and figurines on them. This is known as golu and people visit each other’s house to admire these beautiful displays. I feel that this is one festival that allows us to pray, fast, feast and rejoice at the same time. The shlokas purify the home, aroma of delicacies fills up our hearts and stomachs, diyas bring light to our lives and dandiya raas keeps our spirits high. And at the end each one of us experience divinity, one that sends across a strong message that no matter how strong and tough the evil be there is a power that would shield us and guide us towards the light of knowledge, power and wisdom. Among the Nine Durgas, Maa Shailputri is considered to be the first manifestation of Goddess Durga and worshipped on the first day of Navratri. The embodiment of the power of Brahma, Vishnu and Shiva, she rides a bull and carries a trident and a lotus in her two hands. Her vehicle is the Bull, Nandi. 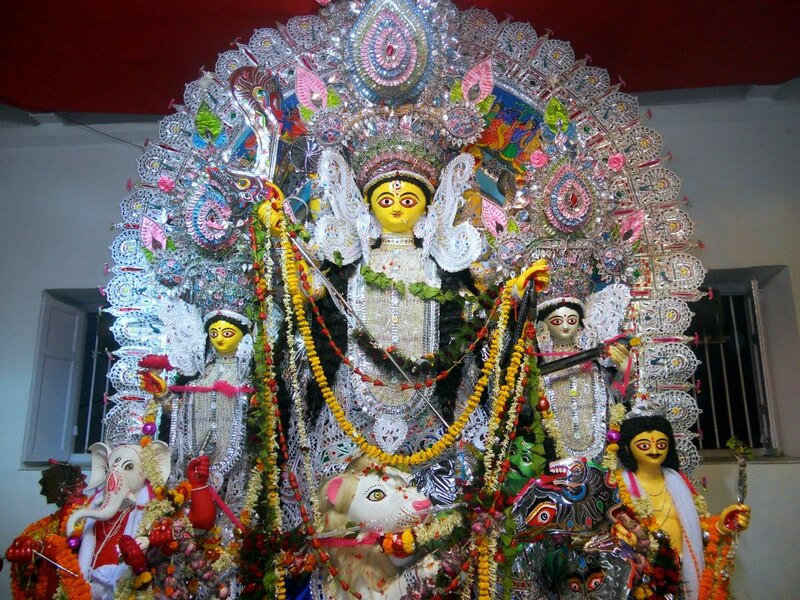 Bhramacharini is worshipped on the second day and is the second form of the Goddess. A true yogini who performs tapasya or meditation, she holds a rosary in her right hand and a water utensil in her left hand. Filled with bliss and happiness, she is the way to emancipation, moksha. With the moon (Chandra) on her forehead, riding the lion is the golden-complexioned third facet of Durga called Chandraghanta. With ten hands, three eyes and holding weapons in her hands, she is the apostle of bravery and possesses great strength to fight in the battle against demons. Kushmanda, the creator of the universe is the fourth form of the mother Goddess, and is worshipped on the fourth day. The universe was no more than a void full of darkness until her light spread in all directions like rays from the sun, which she is aligned with and brought in illumination. She rides a tiger and has eight arms, which hold weapons and the lotus. Because of her affiliation with the sun, she blesses her devotees with wisdom. Representing motherhood is the fifth avatar called Skandamata holding her son Skanda or Kartikeya in her hand. Bright-complexioned and holding lotus in two of her hands, she is associated with the fire (agni) element. Born to sage Kata is the sixth avatar called Katyayani, which represents the daughter form of Durga offering the loving energy of a daughter to the mother. However, she can also be a warrior and fight against injustice as she holds a sword in one hand and a lotus in the other. She rides a lion and is golden in colour. Worshipped on the seventh day is Kaal-ratri, black like Goddess Kali, holding a sparkling sword in her right hand, she battles all evil. Her gesture of protection assures us of freedom from fear and troubles. Her vehicle is the donkey. The eighth day is the celebration of Mahagauri, the calm, peaceful and intelligent form of Durga. She wears white clothes has four arms, and rides on a bull. Her right hand is in the pose of allaying fear and her right lower hand holds a trident. The left upper hand holds a damaru (a small rattle drum) and the lower one is in the pose of granting boons to her devotees. This eighth day also known as Durgashtami or Durga Ashtami or Mahashtami is a very imperative day during Navratri as the whole family comes together to worship Durga . There is also a belief that Goddess Kali appeared from the forehead of Durga on this auspicious day to annihilate Chanda, Munda and Rakthabija, the demons. Siddhidatri is the ninth form of Goddess, worshipped on the ninth day. Siddhidatri has supernatural healing powers. She has four arms and she is always in a blissful happy enchanting pose. Her vehicle is the lion. This day is popularly called Mahanavmi and as per Hindu beliefs, Durga Pooja on Maha Navami is equivalent to the Durga Pooja performed on all nine days of Durga Navaratri.